← Tuesday Is Seniors Day At Walgreens! Click here to get a free gift from Shutterfly this weekend only! *Offer expires June 29, 2014 (11:59 P.M. PT). 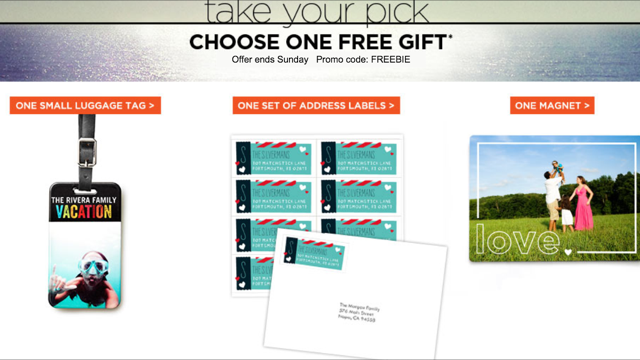 Offer is good for one free set of address labels or one free magnet or one free small luggage tag through shutterfly.com. Must select one of the three products. Offer cannot be redeemed more than once per account and/or billing address. This particular offer code can only be redeemed once. Taxes, shipping and handling will apply. Not valid on prepaid plans, gift certificates, videograms, cards sent using mailing services, prior purchases, orders placed for in-store pick up, purchases made through Shutterfly Pro Galleries. Valid for the intended recipient only. Cannot be redeemed for cash or combined with other offers or credits. Not valid for resale.